In April I travelled to Cape Coast, Ghana where I spent one month working in Central Regional Hospital for my medical elective. I was based in the Global Medical Projects house with other volunteers, approximately a twenty minute journey away from the hospital. The large house was very clean and comfortable, and quickly became my home. The house is set away from the hustle and bustle of the local market and feels entirely safe with its walled courtyard, locked gate and security guard. In a building next to our house lived Eric Essuah and his wife Mary, the house “mum and dad”. Night and day, they were always around and really helped in every aspect of the trip. They helped show us around, ensured we had everything we needed, organised the placement at the hospital, advised us on prices so we were never overcharged, put us in touch with a very cheap and trustworthy taxi driver (who became our private chauffeur when we explored the area), arranged for a local seamstress to make Ghanaian outfits for us and even took us out for meals and to a local bar. Mary took us to her gospel church one Sunday morning and to an Easter celebration beach party, which are experiences I will definitely never forget! They were both always so cheerful and had huge smile on their faces; they made me feel completely at home and safe. Having a housekeeper six days a week, who prepared three meals a day, cleaned our rooms and arranged for our clothes to be washed really was a luxury. It really took away the pressure of having to cook and prepare meals in a foreign country with ingredients I had never even heard of. It was also a fantastic experience to try some of the delicious, local cuisine on a daily basis. Central Regional Hospital is a large and busy hospital. 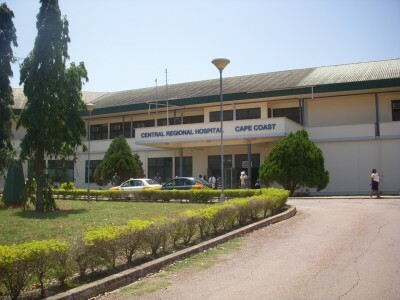 Not only does it receive patients from the Cape Coast area, people are referred here from all of the smaller district hospitals in the Central Region. It therefore has a number of experienced speciality doctors and the patients have unusual and complex medical conditions as well as the diseases that are typical of an African hospital, such as HIV and malaria. The hospital is also a teaching hospital so there are always a number of very friendly medical students on the wards receiving teaching from the consultants, which was great to join in with. The placement was well organised and I was assigned to a doctor on my first day who helped me find my feet and plan my time there. I spent my four weeks working in the obstetrics and gynaecology department, as this is what I had planned to do for my elective, but I could have worked anywhere I wanted in the hospital as staff were very accommodating and flexible. Before travelling to Ghana I had decided that I wished to undertake some research in the hospital, and with the help of Eric, this was approved before I arrived. This was easy to arrange with Global Medical Projects as having somebody in Cape Coast who was in regular direct contact with the hospital allowed my project to be arranged quickly and efficiently. I successfully completed my research by interviewing doctors and patients, and using healthcare records and registers. During my placement I divided my time between the ward, delivery suite, theatres and outpatient clinic. All of the nurses, midwives and doctors were very approachable and helpful. I became good friends with a few of the house officers and they spent a lot of time sharing their knowledge with me and teaching me new skills. The delivery suite consists of one room containing twelve beds for all the women in the first stage of labour (if there are more than twelve women, they have to lie on the floor) and three special delivery rooms down a corridor where the babies are delivered. After completing four years at medical school, the doctors regularly allowed me to assist them in their work and encouraged me to get involved in caring for the patients, but they were very keen for all volunteers to have a hands on approach. I was able to monitor the women in the first stage of labour, perform vaginal examinations and keep a check of the fetal heart rates with a foetoscope (the only piece of equipment available to monitor the baby in the suite). I was able to assist the midwives in the deliveries, and I was taught how to suture any tears that had occurred. Following the deliveries, I monitored the women and babies, and helped to check the women over before they were discharged. Also on the suite I assisted the doctors in treating women who had suffered miscarriages and incomplete abortions. Abortion is illegal in Ghana, but there were many women who took herbal remedies to initiate the process. There were therefore a number of women on a daily basis who presented requiring the treatment. The delivery suite has two theatres attached where caesarean sections are performed. Due to the lack of equipment in the suite, the doctors admitted to being overly cautious and would decide a woman required a caesarean with little definitive evidence of there being a problem. There were therefore a lot of procedures carried out, with 71 caesareans undertaken over the month, the majority emergency surgery. Nearly all were carried out by the house officers and I was able to assist in a number of cases, gaining experience in suturing during the procedure. A common occurrence was power cuts. With no backup power in the delivery theatre, you either had to wait and hope it came back on soon or carry on in the dark. During one caesarean that I assisted in, there were two power cuts: the first whilst the placenta was being removed from the womb and the second whilst the wound was being sutured. During the first we had to pack the uterus with swabs and “pray she does not bleed to death”. Luckily the power came back on after 5 minutes and the woman survived. During the second, after waiting for fifteen minutes, we had to stitch the woman up in pitch darkness using only the light from a mobile phone to guide us. It was definitely one of the most exciting, if not anxious, moments in theatre. In the main theatres, other procedures were carried out and I was able to assist in myomectomy and salpingectomy cases and observe cervical cerclages being performed. The outpatient clinic consists of one small room, one examination couch and one desk with three doctors crowded around, each seeing a different patient at the same time. With no booking system or prioritising of patients, if a person wants to see a doctor they arrive at the hospital early in the morning (the majority at 4am) and queue for many hours. During the clinics I clerked the patients and then either examined wounds, performed vaginal examinations, helped collect vaginal specimens for the pathology lab, scanned pregnant women or scanned women with suspected fibroids and cysts. I also practiced cleaning and dressing wounds. I was taught how to give guidance to couples who are having difficulty conceiving (which included telling the couple to pray hard and sing loudly in church!) and I was encouraged to discuss a number of gynaecological conditions with patients. The obstetric and gynaecology ward consisted of 40 beds and two examination rooms. 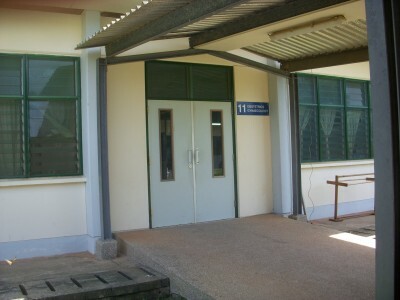 Here I clerked patients, performed vaginal examinations, checked wounds and changed dressings, assisted in induction of labour and monitored pregnant women. Catheterising and cannulating a number of women helped improve my clinical skills and I was able to assist in treating one lady who required chest and abdominal drains inserting before resuscitation was needed due to metastatic ovarian cancer. I think the most fulfilling and enjoyable experience of my trip was working on the outreach programme. We travelled out of Cape Coast to the rural villages where we went into the schools and treated children who required healthcare, but could not afford health insurance or the money to see a doctor. We taught the children how to treat cuts and bites, stressing that they must try to keep them clean and hygienic to avoid infection. We then cleaned any dirty wounds that the children had and put on sterile dressings. The children were so joyful to see us and receive treatment, they were pretending that they had more wounds that needed treating and clung to us as we tried to leave the village. This was very touching and made me really feel that I had helped children that are so greatly in need and hopefully made a difference to their lives. During the weekends I thoroughly enjoyed travelling around the area and really experienced the Ghanaian lifestyle and culture. I made the most of my free time outside the hospital by visiting nearby towns and villages, browsing through the markets, eating from the road side stalls and cafes, taking guided tours through the rainforest, relaxing on the glorious beaches, learning how to play the Ghanaian drums and visiting the many historic sites and tourist attractions in the area. 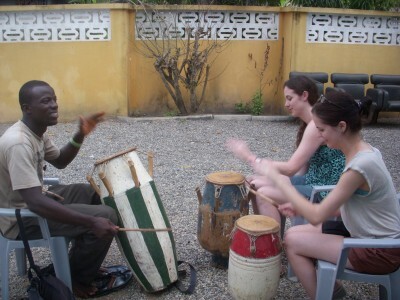 I never sat still during my time in Ghana, each day was filled with new and tremendously fun activities and the time seemed to fly much too quickly. I thoroughly enjoyed working in Central Regional Hospital, I learnt a number of new skills that will help me in my work in the UK, saw interesting medical conditions that I have never seen before UK hospitals and observed and assisted in surgery that was also completely new to me. It was exceptionally eye opening to work in an African hospital and I learnt a great deal about the way healthcare is given in Ghana, and how medical conditions and treatments differ to those found in British hospitals. At times I found it very difficult, especially working in such difficult conditions with the unhygienic and unsanitary wards and the lack of medical and surgical equipment. I will certainly always appreciate the healthcare and facilities available to us here in the UK. However, I found the challenge extremely rewarding and a very exciting experience. It is definitely one I will never forget. The main image that will stay with me is the friendliness, happiness and optimism of the staff and patients who were always extremely pleasant, had a smile on their faces and made my elective such an enjoyable and fulfilling experience. I am confident that I will return Ghana in the futures and will hopefully be able to work at Central Regional Hospital again. I could not have wished for a more exciting and successful trip to Ghana. Everything, from what I experienced in the hospital, to meeting some truly inspirational people, exploring the country and making some great friends along the way, it was second to none. 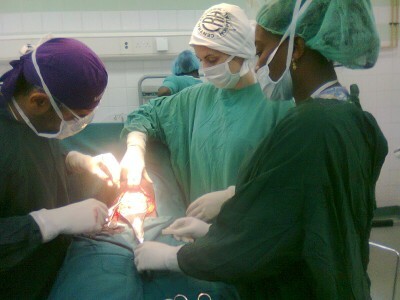 I would recommend Global Medical Projects to anyone planning their medical elective. They organised and planned my placement quickly and extremely well, eliminated any stress that I had about spending a month in a foreign country on my own and took care of all the other things that I hadn’t really thought about, for example, providing my meals, taking me to and from the airport and ensuring that I was safe and well every day and night. I would like to thank Global Medical Projects, and everybody who helped me during my trip, for making my adventure in this fascinating country possible and enabling me to get the most out of my elective. Global Volunteer Projects, Global Medical Projects, Global Media Projects and Gravity Rebels are trading names of Gap Year Sport limited registered in the UK company number 5060079.